Pinot Noir grapes at Liquidity Winery. Photo by Erin Korpisto. 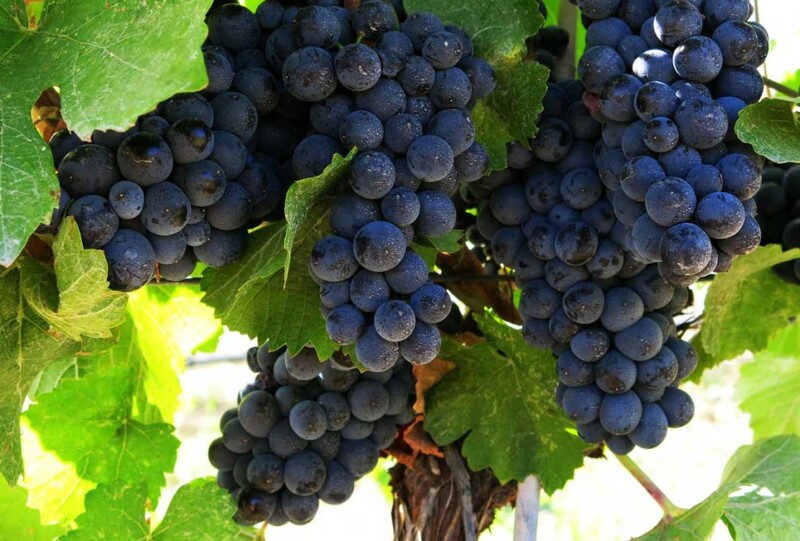 IF British Columbia, Canada were to have a signature red grape, it should be Syrah. Or at least this is what’s been proposed in past discussions in our local wine community. But I think our future lies in Pinot Noir. In fact, all the Pinots do well in our short, hot summers off the west coast of Canada in the narrow, 160-kilometre long Okanagan Valley, a cool climate wine region. Pinot Gris, a colour mutation of Pinot Noir, is our most planted white grape after the first vines arrived from Alsace in 1976, and is made in a variety of styles. On Vancouver Island, where even cooler climes result in a distinctive tart acidity in all wines, oak is often used to temper the tartness. Andy Johnston at Averill Creek also ages his Pinot Gris in bottle for a few years before release. In the South Okanagan, one of the warmest areas in B.C., Tinhorn Creek does extended contact on the lees for added texture and body. I am partial to Pinot Blanc. Two years of tasting white after white as if in a B.C. white wine marathon, and it was clear to my palate that Pinot Blanc did very well here – and went beautifully with our seafood. Sadly, plantings have gone down since 2008, though they’re now holding steady making up just over five per cent of the white wines being made in the province, and in sixth spot after Pinot Gris, Chardonnay, Gewurztraminer, Riesling, and Sauvignon Blanc. (For good examples of British Columbia Pinot Blanc, try Lake Breeze and Blue Mountain). 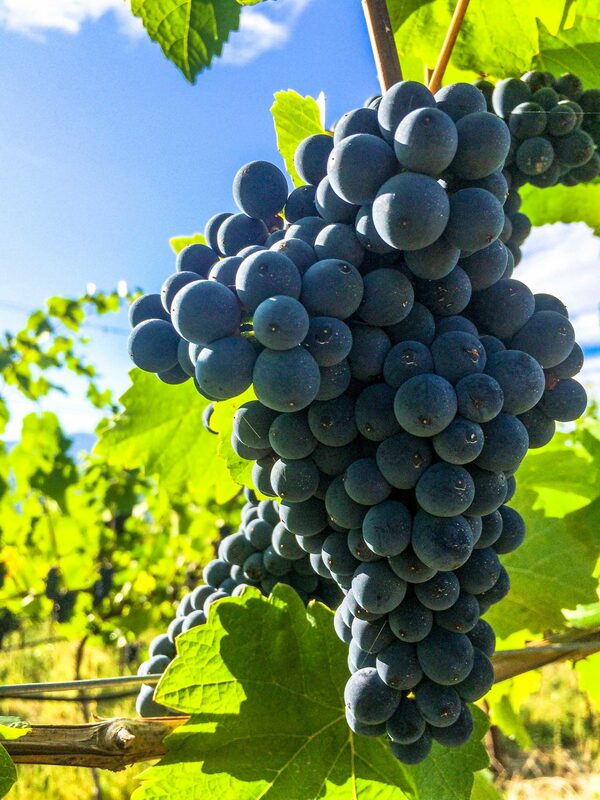 Pinot Noir is the rock star grape of the wine world. And if wine were men, as I cheekily wrote, he was the one a girl wouldn’t even dare hope of meeting. He was strong, yet gentle in wondrous ways. The gorgeous, thoughtful man who swept you off your feet in the bedroom. Capable of power tools, and yet, secretly glides gracefully across ballrooms. On my recent visit to the Okanagan Valley this July to see some of the new wineries, tasting rooms, and winery restaurants in our vast province, what struck me most were the hopes, aspirations, and financial investments in this beautiful, thin-skinned and testy grape. Herewith, three producers to keep an eye on as they ramp up their Pinot Noir programs. Perhaps you too, will find yourself gliding across ballrooms with this irresistible grape. 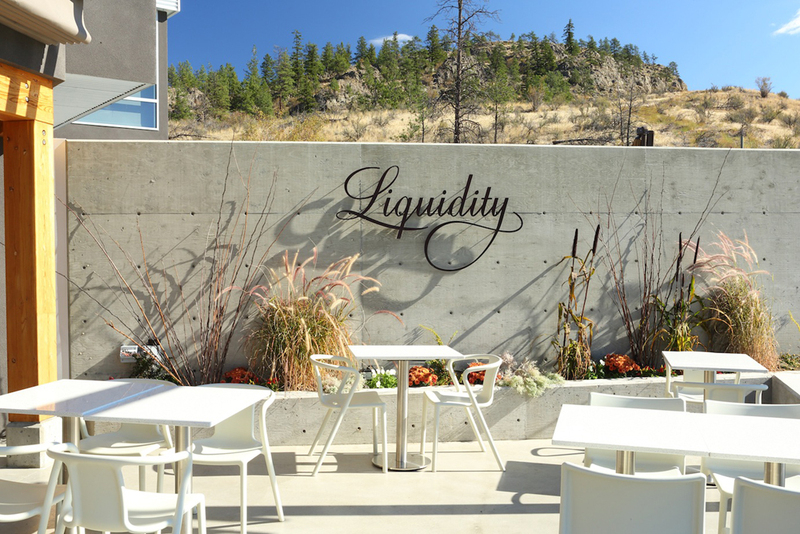 Even before the walls went up at Liquidity in Okanagan Falls, it was hard not to be won over by its sweeping view of Vaseaux Lake and McIntyre Bluff, a rocky face overlooking small hills of vineyards. It was the summer of 2013 and though the foundation and rebar was laid – we could see where the tasting bar would go – there was no tasting room, no hyper-local bistro, and no art gallery. These were all future plans that Liquidity president and visionary shareholder Ian MacDonald was animatedly talking about as he showed us around the property, his passion for a destination winery painting us a picture of what would be. Two years later this July, I arrived to see how an infinity pool added to the serenity of the scene, now complete. The indoor/outdoor bistro was so local, it didn’t change its menu by the season, but by when each vegetable or fruit was harvested. The flatbread was so generously topped with ingredients, it was more pizza than bread, flat or otherwise. The assorted warmed olives came with chorizo and roasted nuts. And the pasta was excellent, even cold because of all the talking, and then asking questions I was doing, when Ian came by late, as we were having lunch on the outdoor section of the bistro. Both the bistro and tasting room are sleek, yet welcoming. It is, as my friend who’s joined me on this visit, notes, a place that makes you want to stay and linger. There are pieces of free standing art made of steel by Vancouver sculptor Martha Sturdy on the property, and paintings by other local artists lining the walls of the tasting room and bistro. A new artist lecture series is set to start this fall, says Ian. He is still full of ideas, still full of boundless energy that emanates from him like soft rays of light. The label on the bottle has changed – to a sleeker, cleaner white with the name Liquidity in silver. The winery still makes the Dornfelder rosé, which I tasted two years previous on their crush pad because that’s all that had been finished then. It surprised me because its deep colour hinted at a sweet wine, but was completely dry on the palate. They’ve added a sparkling white, which would be better if its bubbles weren’t created from a simple injection of carbon dioxide. It’s got bubble all right, but it’s one-dimensional, and lacks finesse. Judging by the fact that it’s sold out, I don’t imagine those wanting a glass of bubbly to pair with the outdoor patio have minded so much. Liquidity also makes one of the best, if not THE best, Viognier in B.C. : full-bodied with heady aromas of peach, honey and melon; spicy with refreshing acidity. “Wow” is what I wrote in my notes. But it’s their Pinot Noir program that Ian mentions will be ramped up, that’s going to have me coming back, again and again. The Lucy Vineyard, just in view of the view 275 metres from the winery, and from which most of their grapes were purchased, was purchased outright. It’s planted with large blocks of Pinot Noir, Chardonnay, and Pinot Gris. The long-term plan is for Pinot Noir and Chardonnay to be their flagship wines in small-lot productions. “We believe Okanagan Falls is the best place for Pinot and Chardonnay in the valley,” says Ian MacDonald, president of Liquidity Winery. 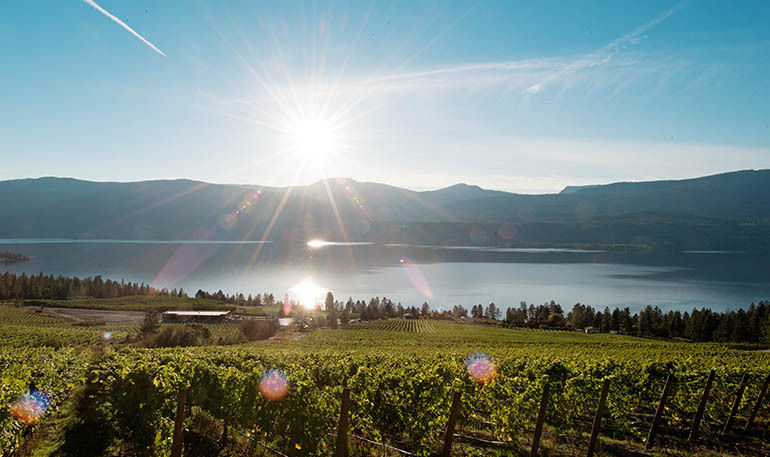 The Okanagan Valley is a narrow 160-kilometre stretch that runs north-south, with microclimates in each subregion, and a dizzying array of soils. Winemaker Alison Moyes, previously at Stoneboat Vineyards, also in the Okanagan, joined the winery this spring with a mandate and resources to build up the Pinot Noir and Chardonnay focused portfolio. Next year, they’ll have eight clones of Pinot Noir to work with. “The plan is to release the wines when ready,” says Alison. Next year’s wines, whose grapes were harvested in 2014 and in French barrels during my visit, will be released in three tiers of increasing quality: regular, reserve, and equity, which gives a nod to the origins of the winery name. Liquidity, Ian says, refers to liquid assets, which is how the original three shareholders saw their wines. Quality is the focus, and Alison says she’s getting every measure of support. The currently released 2013 Pinot Noir has a pale ruby colour, with fresh red berries on the nose and palate. It’s pleasing, and it’s not going to blow your mind. But if seeing and tasting the realization of a vision to start a destination winery is any indication, it will be a delicious evolution as the winery turns its focus to this enigmatic grape. As we taste the maturing wine straight from a couple of the French barrels, each holding a different clone of Pinot Noir, I couldn’t help but look forward to returning. To tasting how the flavours and characteristics of each barrel’s contents would be woven into a final blend. To enjoying that glass, while taking in the stunning view, the gorgeous food and art. And linger as the sun shone overhead. 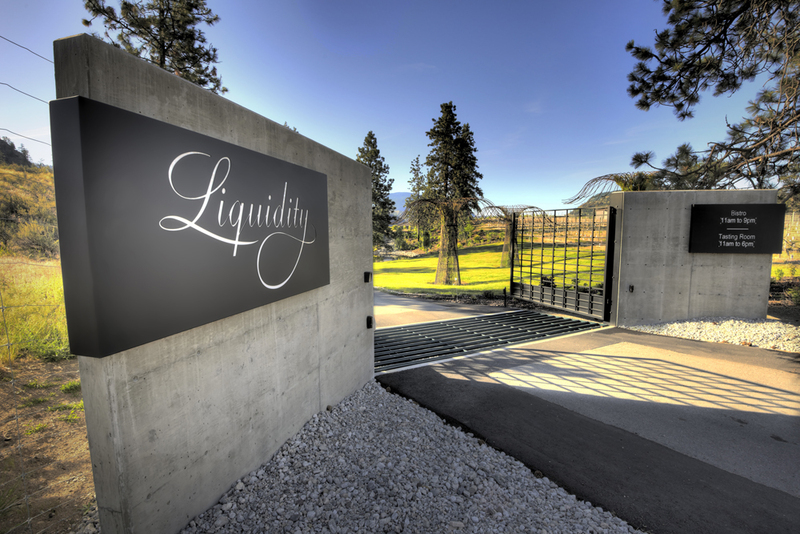 Slideshow photos courtesy Liquidity Winery. Winemaker Grant Stanley. Photo by: Gloria Chang. 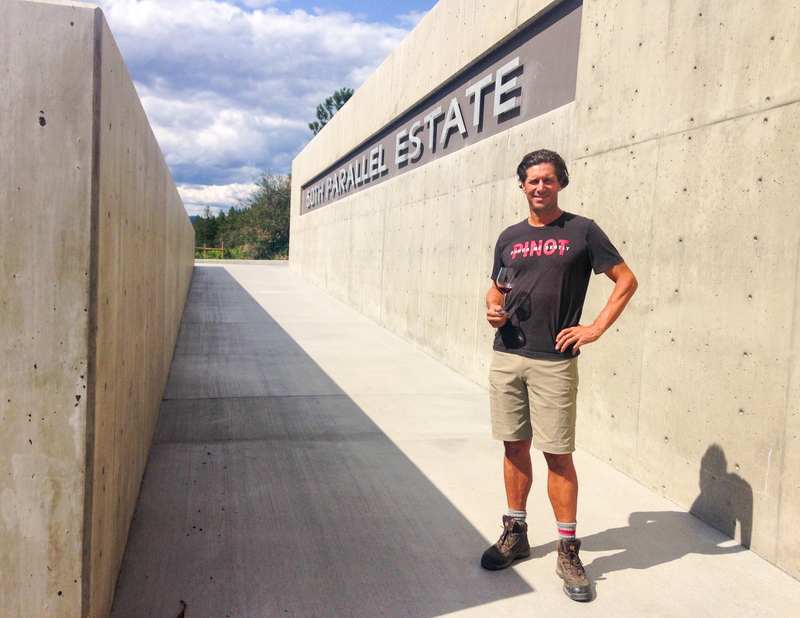 Meeting 50th Parallel Estate Winery co-owner and winemaker Grant Stanley is like seeing the proverbial kid in the candy store come to life. 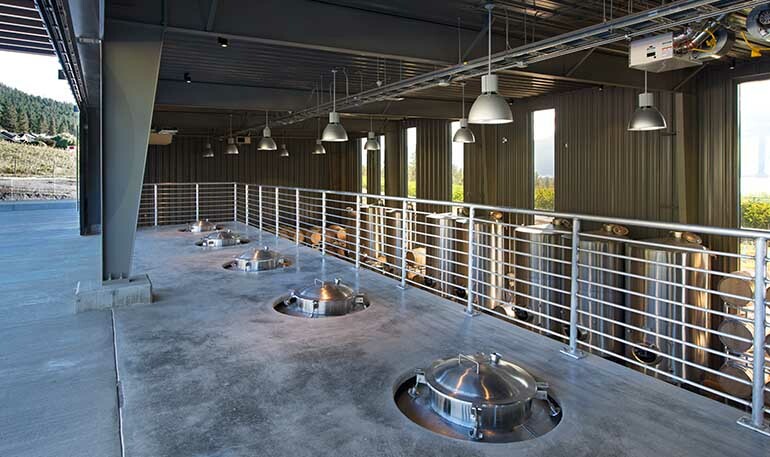 His eyes are lit up, his hands in constant motion, as he excitedly explains how the cantilevered crush pad – and really everything at the winery – was built with handling Pinot Noir and a few aromatic white wine varieties, gently, in mind. Made of 30,000 pounds of concrete, the floating crush pad is tied back into the mountain with no support from below. Large wooden doors open up to reveal the tops of the stainless steel fermentation tanks, so that the crushed grapes can be placed in them with the help of gravity, rather than pumps. 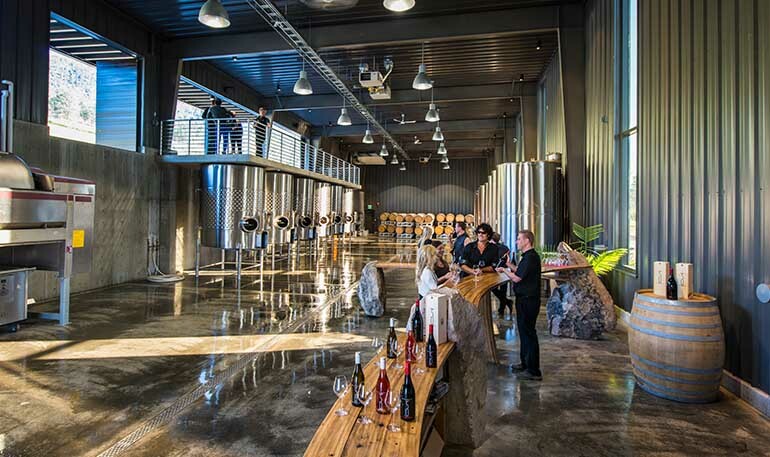 Below, you can see the tasting bar open to the fermentation tanks in a wide, open space, which then leads to a barrel cave blasted into the granite mountain that stores the Pinot Noir in barrels. We get up close to the stainless steel fermenters as Grant explains how spontaneous yeast will be used to ferment the wines whose grapes are. And just as I think that spontaneous is a much better word than wild or indigenous to describe yeast that’s not deliberately added, it becomes apparent why. Grant was one of the study authors in a landmark study on wine yeast that showed that regardless of the yeast used to start a fermentation that turned a grape must into wine – naturally occurring or added – a dominant commercial strain of yeast took over and finished it. Essentially, that meant that there was no such thing as a “wild” fermentation. Still, winemakers like to use spontaneous yeast because many believe they produce a more complex wine, regardless of which strain of yeast ends up doing most of the work. Grant is no stranger to making benchmark Pinot Noir in British Columbia, but this is his first dedicated barrel cave. A dual citizen of New Zealand and Canada, he worked 15 vintages in New Zealand and Oregon as a “willing and humble slave to the high priests of Pinot Noir”, so says their website, before becoming the head of the winemaking team at Quail’s Gate Winery in Kelowna for 10 years. 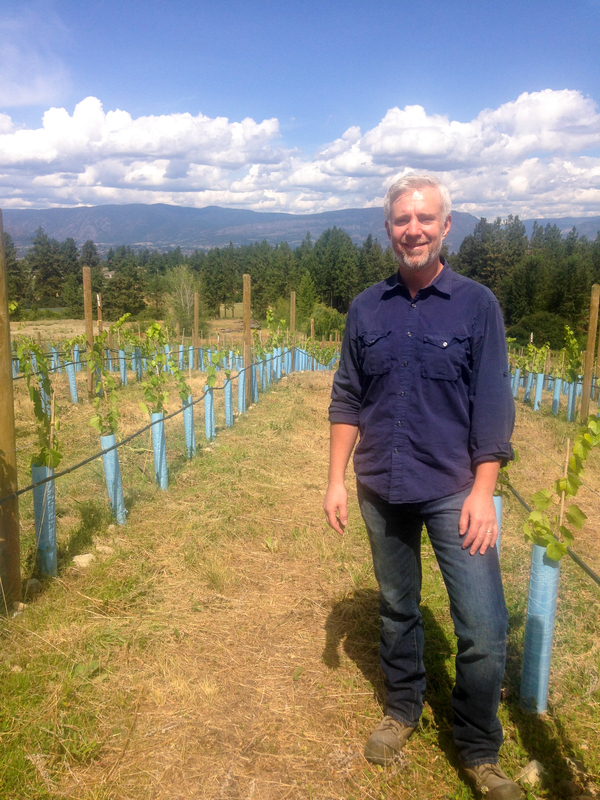 He joined 50th Parallel in 2013, and the winery opened its doors to the public this spring. With hands in the design of the winery, he was able to finally get a proper cave for his maturing Pinot Noirs. Made of 30,000 pounds of concrete, the floating crush pad is tied back into the mountain with no support from below. Photo courtesy 50th Parallel Estate Winery. The barrel cave has a skylight and is smartly built, with one wall that can be knocked out when the winery eventually gets expanded, but it’s probably not THE reason that you, as a wine lover, would want to make the trip. No, it’s the whole grape-to-glass experience, from seeing the grapes in the vineyard, to the fermentation tanks that line the walls to the gorgeous view of the lake outside, to the tasting bar where you have a view of the whole process, that makes 50th Parallel a must-visit. It’s also a winery where you’ll want a tour. Everything is so well-planned. Everything is beautiful. This too, was envisioned as a destination winery. 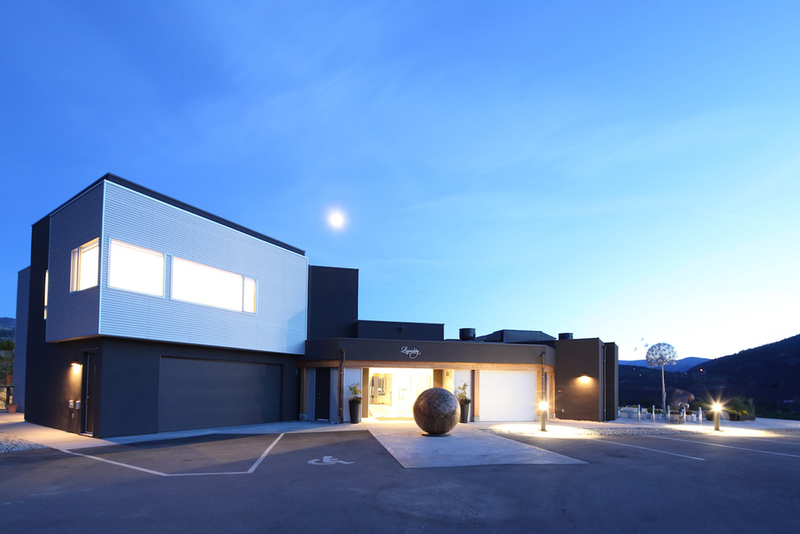 The next phase, when funds are in place, will see the addition of a beautiful glass events space, a seasonal wood-fire bistro, and a glass tasting room with a view of Okanagan Lake, which runs parallel to the winery and vineyards. More interesting than the barrel cave for wine geeks, was Grant’s laboratory tucked in among the offices. Here, he could monitor how the grapes were doing from each block of vines when it came close to harvest time – the grapes’ acidity and sugar levels. Grape growing is more science with analysis of soils, aspect, and slope, when it came to planting. But winemaking is more art that rewards those who pay the closest attention to those grapes and the ability to react most nimbly and in the case of Pinot Noir, most gently. Grant was paying very close attention. 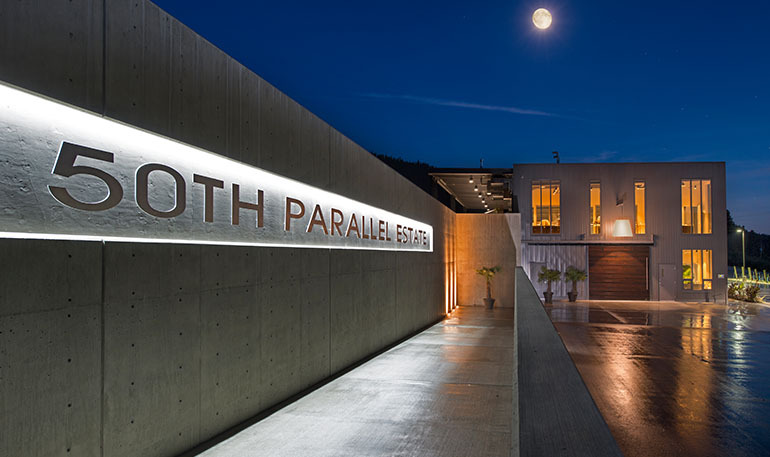 50th Parallel, so named because it sits at the 50th parallel latitude, is the northernmost winery in the Okanagan Valley, located north of Kelowna in what is referred to as Lake Country, beside Okanagan Lake. 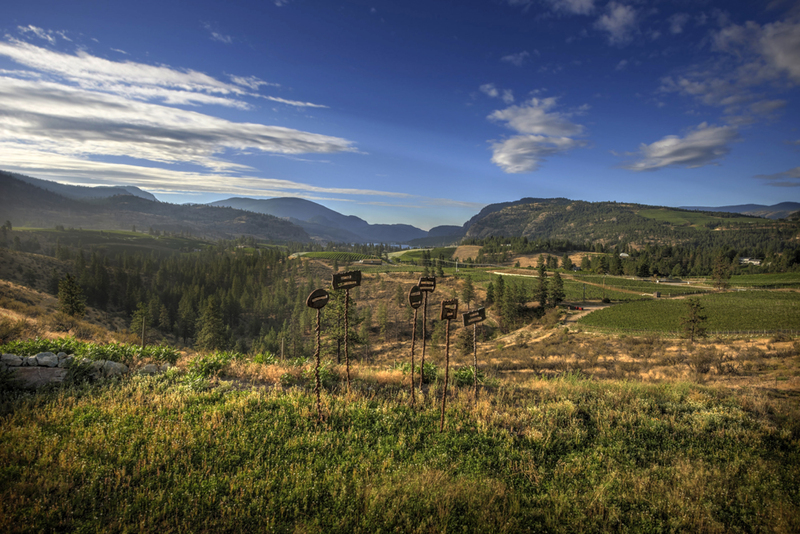 (There are a few wineries even further north in Vernon, but beyond the Okanagan Valley wine region). It was Pinot Noir that brought me to 50th Parallel. Two blind tastings of Pinot Noir I’d attended, where I’d rated its wines in the top three of both, left me wondering what this new winery was, and who was making their wines. And when I tasted the 2012 Pinot Noir again, it was reminiscent of a wine from the village of Pommard in Burgundy, France that I’d poured at a wine tasting two months previous – powerful, ripe, layered, with refreshing acidity. A sip of heaven. It will be Pinot Noir again that will bring me back to see how their wines and winery evolve. Slideshow photos courtesy 50th Parallel Estate Winery. 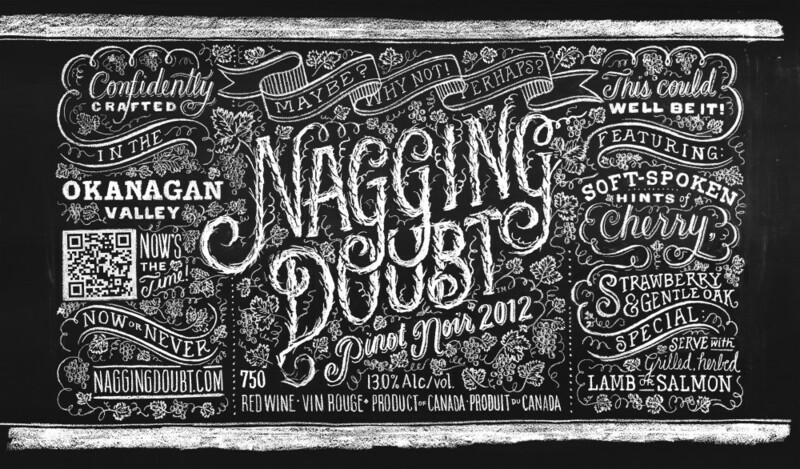 Winemaker Rob Westbury at Nagging Doubt. Photo by: Gloria J. Chang. There are no breathtaking views on this farm. It is a farm, where grapes are grown, and a dog named Clover has the run of the land. A barn, painted slate gray, is adorned with the name of the winery on the outside. Inside, the doors to the horse stable have been left intact to pay homage to its past. It is charming in its simple farm-ness, quiet, and real, which was the important thing. The site wasn’t chosen because it had the best view or aspect or slope for grape growing, but because winemaker Rob Westbury could make his dream into a reality. The farm also came with a house for his young family. It was a series of weekend visits to the wine regions of Napa and Sonoma while working in San Francisco for a consulting firm that inspired him to start living his dream. In 2010, he started Nagging Doubt as a virtual winery, buying his fruit from local growers in the Okanagan and making his wines – 125 cases – through a custom crush facility. If he’d kept it that way, he might just have broken even this year. But of course, that was never the plan. With a current total production of less than 1000 cases, he’s part of a growing group of winemakers in British Columbia venturing to make a wine under their own approach, hands, and label. Without deep pockets or shareholders, making wine this way is a way to experiment, to make wine they love, and as is the case for Rob, to start making his personal dream come true and do both. That first year, Rob sold his wines by hand, just as he made them, cold-calling restaurants and private liquor stores. The second year, he made 250, then 500, 800, increasing to just less than 1000 this year. A tiny drop really, in the world of wine. In 2013, he purchased the farm, converted the barn into a winery, and planted an acre of Pinot Noir vines. In the Fall of 2014, his winery was officially open. “You’ve got to really love this,” says Rob Westbury of his wine journey. The “this” is a lot of cleaning. Cleaning barrels, tanks, and maintaining grapevines. Rob currently has four wines in his portfolio. The Pull 2013 is a smooth red blend made of Bordeaux grape varieties: Cabernet Sauvignon, Cabernet Franc, Petit Verdot and Malbec. It is rich and pleasing, without strong tannins that require further ageing. Balanced and likeable. Maybe even like Rob. The 2013 Chardonnay, sourced from Anarchist Mountain in Osoyoos, is subtly oaked with hazelnut on the nose, bright apple and pear on the palate. Like Rob. The 2013 Viognier, though rich in mouthfeel, is not so headily aromatic. It has an interesting, stone-like finish. Again, like Rob? I wonder if wines sometimes reflect the personality of the winemaker. Certainly, it would make sense when crafting them so closely, in such small amounts. While these wines are made with grapes grown in Osoyoos, the grapes for the Pinot Noir are from Kaleden, just north of Okanagan Falls. The 2013 Pinot Noir has a subtle toasty characteristic from the oak, rather than overt and in your face, with a beautiful aroma. Partly fermented with spontaneous yeast and partly foot stomped. It is reminiscent of a Pinot Noir from Marlborough, New Zealand wine, I say. Rob doesn’t look pleased. He is inspired by Burgundy, France, the historical and spiritual home of Pinot Noir. Well, perhaps the southern end of the Côte de Beaune in Santenay, I think, where the wines were lovely, but not as concentrated. Less power tools, more ballroom dancing. Rob has five and half acres under vine on his own land now, the white grapes of Chardonnay, Siegerrebe, and Ortega, in addition to his Pinot Noir. His first estate Chardonnay, a white blend, and Pinot Noir will be harvested in the fall of 2016 and ready for 2017. I plan to return, to taste the estate Pinot Noir of course, but also to taste the cool climate loving whites he’s planted. Nagging Doubt is not meant to be a destination winery as the other two wineries. But in many ways, Rob’s story will be the most interesting to follow because his is the most personal, and perhaps, the most experimental. Photo courtesy Nagging Doubt Winery. Click to see a cool video on how the art on the wine label was created. Three wineries. Three origin stories. Three pockets of one of the world’s most northerly wine regions. One beautiful, finicky grape. It’s an interesting time in the Okanagan Valley.